The French Open is gradually entering its climax with the fourth round halfway over. So far, the tournament has seen some thrilling matches with a few of the big names making steady progress in the tournament. However, this year’s French Open has seen a number of upsets so far, with 25 of the 64 seeded players biting the dust before the third round. The Women’s tournament in particular has seen plenty of high-profile exits, assuring the French Open of a new Champion. The elimination of Venus Williams also means that there will be a brand new Women’s Grand Slam champion. Here are the biggest upsets from the Women’s Singles tournament so far. The British player put up a few solid performances this year, the most notable of them being her winning run in the Miami Masters which elevated her ranking to a career-best World No.7. 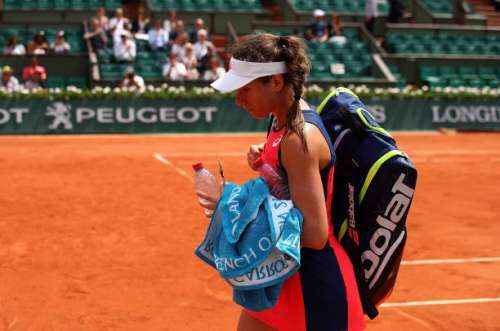 Despite Konta performing poorly at the Madrid and Rome Masters where she exited at the first and third rounds respectively, she was considered a dark horse for the French Open and was expected to register her first victory at the tournament this year. Konta’s first round opponent was Taiwanese Hsieh Su-wei who was ranked 109th in the world. Konta began the match strongly and breezed past Hsieh in the first set 6-1. However, the Taiwanese recovered well and won the second set decided through the tie-break and was looking solid in the third set. Konta was in no mood to throw in the towel and tried her best to break Hsieh’s serve at 4-5. However, the 31-year-old held her nerve and saved four break points before finishing the match with an ace. This was Hsieh Su-wei’s first ever victory over a player ranked within the top 20 and Konta’s winless streak at the main draw of the French Open persists.